In such a hot market, how should you, as a business owner, begin your search for warehouse rental space in Columbus, Ohio? The steps below offer guidance on how to prepare, find, lease or rent, and optimize your next place! Why Anchor Your Warehouse To Columbus, Ohio? There are several reasons why businesses large and small are choosing to rent and lease commercial property in Columbus, Ohio. The city has quickly become an attractive place to establish and grow professionally. For instance, Columbus functions as an ideal location for millennials to begin their journeys, with plenty of job opportunities after college, affordable rents, and a trendy downtown scene. Columbus is also a perfect city for families looking to settle down; the city ranks number four in Realtor.com’s Market Hotness Index because of the relative affordability in the cost of living. Businesses also love that Columbus falls within proximity to many other major U.S. cities, making industrial space for lease extremely appetizing for companies seeking a convenient and streamlined process for the delivery of goods. Proving this boost in popularity are statistics observed by global CRE firm, JLL, which found that vacancy rates of industrial properties are at an all-time low of 4.4%; while there are over 3.2 million square feet of industrial space under construction. Additionally, Central Ohio has the second-lowest effective tax rate in the country for warehouse facilities. Rent and purchase costs were also found to be one of the lowest in the country, as observed by the economic development organization Columbus 2020. Have we convinced you that the Columbus region is impeccable for establishing your warehouse operations? Let’s walk you through these four practical steps to claiming and optimizing your new industrial property. After years of sluggish economic growth, developers placed the construction of new industrial units and warehouse rentals in Columbus, Ohio on the back burner. Now, with the radical surge in demand over the last few years, prospective buyers are faced with several options when searching for prime space. That said, you must follow specific steps before the search begins, starting with a list of your wants and needs. What are your current needs? Before you begin shopping for warehouse rentals or leases, you must know your do’s and don’ts. Will your industrial property be used solely for storage and distribution of products? Or, do you also plan to use it for manufacturing? Having the space for storage and equipment is a broad necessity. You may also require additional features, including ceilings of a certain height, reinforced floors, climate control, a loading dock, and various power sources. What will you require in the future? In the current market, you need to think ahead. In addition to figuring out what you need right now, you must research both the trends of the economy and the trends of your business. Understanding movements in the market and the industry will help you formulate accurate projections for needs that may arise over the next few months or years. Once you have your checklist written out, it’s time to start actively pursuing your options. Hiring a knowledgeable CRE broker (see the last paragraph) to aid in your search can prove invaluable, especially if you are unfamiliar with the area in which you are looking. A commercial real estate broker can also help guide you through difficulty in finding the best location, lease specs, and price while you take these next steps. Inquire with your current landlord. You may just be looking either for additional units elsewhere or a full-on space upgrade. If this is your situation, and you already rent warehouse space, consider speaking with your current landlord before taking any next steps. Hopefully, you have built a healthy relationship with the building owner, so there’s no harm in inquiring about additional warehouse rentals. The chances are likely that your landlord has other properties elsewhere that may suit your needs. Contemplate subleasing. Investopedia describes a sublease as, “… the renting of property by a tenant to a third party for a portion of the tenant’s existing lease contract.” Establishing warehouse rental space from another tenant; however, it could be the best direction when you’re focused on a particular location and availability is null. Avoid making a rash decision. No matter how convenient it may seem, conducting due diligence on both the tenant you’re subleasing from, as well as the landlord, are vital steps to take before agreeing to a contract. Explore Columbus’s surrounding areas. Why pursue warehouse rental space in Columbus, Ohio? The Arch City may prove to be the perfect landing spot for your operations because of its proximity to a large swath of potential customers. And, if you cannot locate a place in the city’s boundaries, Central Ohio offers a prime location as half the U.S. and one-third of Canada are within a single day’s truck drive. Additionally, you can achieve affordable commercial real estate, low taxes, and a strong Midwestern work ethic among your employees without having to stress about being in the city’s center. Utilize logistics companies. Whether your warehouse rental space is in the heart of Columbus, or If you end up having to lease in a surrounding area, you may need to hire a company for transportation and operations. Luckily, in Central Ohio alone, approximately 80,000 employees are working in logistics at over 4,000 companies, making these services available at all times. Consider making concessions. Let’s say that the distance is a deal-breaker. What can you do to ensure a location within a metro area? Consider an offer of concessions to a potential landlord, such as prepaid rent. Help you beat your competition and enhance your chances of being selected for the property with concessions. If you’ve made it past the first two steps, congratulations are in order! With demand for warehouse space for rent and lease outpacing supply, you should consider yourself quite lucky. Nonetheless, coming to a lease agreement on your space can be equally as challenging a process. Do your homework on the landlord. Perform due diligence on the landlord before signing anything. Figuring out beforehand what kind of person you’ll be dealing with, whether they’re recognizable in the community, or if they have legal problems, can save you and your business from unnecessary hassle. A quick online search may uncover a few informational tidbits, but don’t hesitate to reach out to consumer protection agencies or the local courthouse. You may also want to check the experiences of any current tenants. Verify usable square footage. Another crucial bit of information that we recommend immediately doing is confirming the amount of space you’ll be able to use. Surprisingly enough, when a property is listed for lease, the square footage calculated for the property is not necessarily the same amount of space you will occupy as the tenant. Areas such as columns, walls, recessed entries, storage closets, and restrooms are all taken into consideration. Therefore, if a building has 100,000 square feet in total, there’s a chance that only 85,000 square feet are usable. Recognize that a lease agreement is not one-size-fits-all. Unlike leases for residential properties, a commercial property lease does not necessarily have a standard format. As such, ensure all required specifications are met by hashing out a lease together with your future landlord. A pro forma lease agreement may be beneficial for both parties because it is a general use document that includes the standard language and terms of the lease agreement. Because the standard document is customizable, it will better prepare you for any future negotiations. Hire an attorney. Working with a commercial real estate broker will serve as an invaluable tool along the way. However, it is also advisable that you hire an attorney who specializes in commercial lease agreements for warehouse rental space. Not only will having legal representation lower your stress level, but it will also put you in a better position to negotiate and may end up saving you money. Understand the rental rate calculation. Lease agreements will include either (1) a gross lease rate, or (2) a net lease rate. Most commonly used is the gross rental rate. The rate excludes aspects that the landlord is responsible for, such as maintenance, insurance, and taxes. The riskier of the two is the net lease option. Under this option, a lower rental rate may mean that the tenant is responsible for taxes, insurance, and maintenance. Regardless of the rate method, the rental agreement should clearly state the calculation for the rental rate. Often, a rental chart is included to explain current and future prices. Be aware of your obligations. As with the net lease option, you may end up having responsibilities that exceed the minimum. For example, your new landlord may ask your company to foot the bill for (1) general maintenance; (2) various repairs; (3) installation costs for climate-related additions such as heating, ventilation, and air conditioning. Move-in costs could be a substantial negotiating piece affecting your expenses, so make sure you inquire early in the process. Well done! It’s time to move into your new warehouse rental space in Columbus, Ohio. As exciting as it may be at first, you shouldn’t rush the move-in process. You have an excellent opportunity to create the environment and outline the workflow that your business necessitates! Consider hiring a professional organizer experienced in inventory and warehouse space. Perform a strict analysis and plan. While planning can prove tedious, it is a critical move to make in each step of this process. Have the list of current needs you created from “Step 1” and compare that to your new warehouse rental space. Take into consideration your daily processes, the pace of your operations, staff needs, and equipment placement. Maximize space, streamline processes, and help generate a significant ROI by creating a plan for your warehouse setup. Research storage methods. 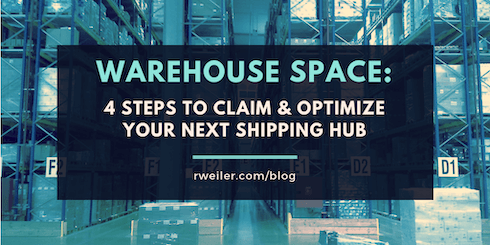 Your warehouse is considered “full” when storage density (or availability) hits 85%, to allow for incoming arrivals. Fortunately, there is a wide variety of ways to place your inventory to help maximize your new warehouse rental space; however, it depends on your specific business’s processes. Expand upon the average mix of bulk storage and pallet racks. More modern methods of storage, such as across aisles, over work areas, and above docks should optimize usable square footage. Remove wasted space. Eliminating wasted space in your warehouse rental works hand-in-hand with new storage methods. Two examples of include (1) adjusting the width of each aisle to increase the number of aisles, therefore, increasing the amount of stock; and (2) observing and removing any obsolete inventory that is taking up valuable storage space. Let The Robert Weiler Company Be Your Columbus Warehouse Rental Tour Guide! Have you noticed that warehouse space for rent, lease, and sale is becoming more difficult to find? There is no doubt that industrial real estate has reached an all-time high. So, don’t leave your search to the luck of the draw! The Robert Weiler Company continues to serve the Central Ohio commercial real estate community for 80 years! As such, our team has a deep understanding of the market for warehouse rental space in Columbus, Ohio. To get started on your search, reach out to one of our brokers by calling 614-221-4286.